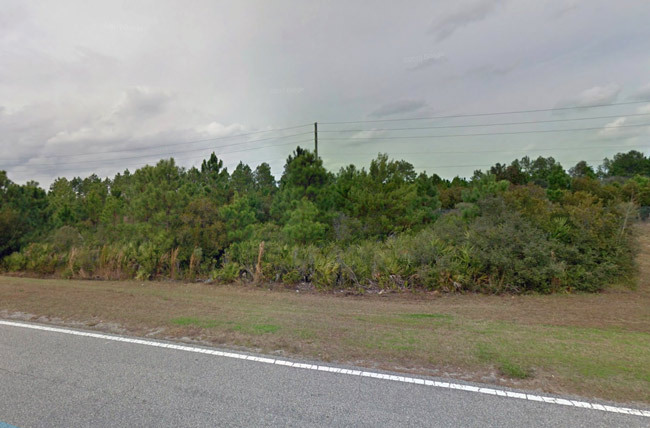 The land across from Matanzas High School: picture a shopping center there. The Flagler County Commission approved a formal step in a land transfer of formerly county-owned acreage along Matanzas Woods this morning, allowing Palm Coast government and a developer to move forward with what is expected to be a sizable, “regional” shopping center that may eventually include restaurants, a gas station, a convenience store and a grocery store. The planned development across the street from Matanzas High School’s sports fields is in its earliest stages, but it would be the first large-size shopping center at the north end of Palm Coast, reflecting the long-expected development of the Matanzas Woods Parkway corridor since the opening of the Exit 293 interchange with I-95 in March 2016. The interchange was two decades in the making and entailed some difficult negotiations and disagreements between the city and the county along the way, with land and impact fee money at stake. But in the end all was worked out as the county deeded the parkway and several tracts of land to Palm Coast, among them the acreage at the center of today’s action. The nearly 8-acre parcel was actually deeded to Palm Coast in March last year. But it includes a nearly 4-acre segment that contains a retention pond. The developer, Matanzas Holdings LLC, wants to move that pond in order to facilitate the development, and would do so in a land swap with the city. For that exchange to take place, the county’s “written consent” of the exchange of what’s referred to as Parcel 9 was required first, as Beau Falgout, now the city’s interim manager, wrote County Administrator Craig Coffey on Sept. 6. The county commission gave consent to an initial land exchange last year. Coffey this morning wanted his commissioners to know that things do work out between county and Palm Coast government, even if they sometimes take a while. City spokesperson Cindi lane said a Publix has been mentioned as a possibility but there are no firm plans yet, notably because land issues have to be worked out first, such as today’s steps and others yet to come. Due diligence is ongoing with the parcels involved in the land swap between the city and the developer. “Once the land agreement goes through then they’d have to submit for a master plan development rezoning to do what they want to do,” Lane said. Lane noted that the plan is for a regional rather than a neighborhood shopping center. It would serve the neighborhood, but it would also include highway-commercial amenities, with I-95 being so near. “So it’s a little bit bigger than a residential type center,” Lane said. But she noted the center would likely not open for another couple of years, with all processes at their earliest stages. What about the land that was landscaped and walkways put in on Rt 1 ?? Any reason that can’t be used instead of causing extra traffic tie-ups near the school?? Great, kill more trees for more low-paying jobs that will keep people on welfare and food stamps. I’m sorry but no, jobs are not jobs, and work is not work. People need a living wage and working retail does not allow for that. Palm Coast needs professional jobs, ones like I travel to Jax for to make what I should make here, in town, if we had that kind of work. Pathetic waste of trees and land. There goes the “other” neighborhood ! NOT good for the rest of commercial -zoned Palm Coast OR it’s businesses. You are doing to Palm coast what towns around Atlanta did – selling land to the highest bidder without any type of zoning intelligence or care as to how it is going to harm your other businesses. Put a gas station there, and maybe a restaurant, but that should be IT. Otherwise you will end up with empty, bedraggled stores losing money hand over fist. Great news, Publix would be a keep choice, since they are a top company to work for, with excellant benefits. Nice to see good progress being made. About time. Residents of Matanzas Woods have to drive 5 miles to the nearest store, even for a quart of milk! I’m interested in this idea of “relocating” a pond. When it rains will the water know it’s not supposed to pool up in the (now) parking lot? Will it run off where it is “supposed to”? Will it flood the new shopping center? Will it flow the wrong way and flood the athletic fields? Who knows. Messing with drainage in Palm Coast is a guessing game. The interchange off-ramps are so close to the crest of the bridge, there already exists a sight distance issue which inhibits the flow of traffic onto Matanzas Parkway. I suspect increased traffic from the L and B sections to businesses directly across I95 will increase the likelihood of accidents as well as lengthy queues off the interstate on-ramp due to the increased through traffic of the bridge. These off-ramps can’t be placed further out without further land acquisition i suspect. I can see my commute utilizing US 1 and Old Kings again as a result, avoiding the hassle and safety concerns. I think the most cost effective solution might be to add another signal to the southbound off-ramp, which would provide the break in traffic needed on both sides to clear out with enough frequency. A “Regional Shopping Center”, and all that comes with that, across the street from the High School? Perfect! Could there possibly be any downside to that? I’m certain that all the home owners in the neighborhood are jumping with enthusiasm. I hope that we can get as much traffic off of that exit and into our neighborhood as possible, 24/7. People, traffic, lights, noise, crime, commotion….. Can’t wait! And now we will have our very own Exit 293 homeless vagrants! We can call them the “293 Gang” or the “North End Go Getters”. They are gonna love a shopping center! They can watch the activities at the school when they get bored, and attend football games on Friday night! Sweeeeeet! Heck, they can dress up as Pirates and be mascots. Just being sarcastic everybody, this is really wonderful news, just wonderful…. This city is a joke ! No opportunity to make decent money at all! Restaurants and retail are not career moves ! minute things. For the ones who want high paying Jax jobs to come here? Better move to Jax. Not happening in PC. And what happened to the Gate gas station that was slated next to Tractor supply? Lot is for sale! Another Publix? Tell me it isn’t so. We have what six Publix how many more do we need. Put a Walmart grocery there or any thing but another Publix. Heck how about a Wawa? This shopping center should be at US1 & Matanzas Woods Parkway. Are we upgrading our infrastructure to support it? Everyone gripes and groans about traffic and congestion but we forget about infrastructure. And upgrading infrastructure usually means more taxes. We are going to pay increased taxes on water already. It would be an asset to the people that are tired of driving into the congested F section Publix or worse the Walmart traffic. It is a service or convenience. Please NO MORE McDonalds, Wendy’s or other fast food! Let’s think about some real sit down restaurants that aren’t just ANOTHER pizza shop. Also, I love Publix, but don’t we have enough of those too? How about a Whole Foods, Fresh Market or Trader Joe’s? Our town has changed and so have our needs!! People are more concerned with health and being active so why not promote that with the establishments that are ‘invited/allowed’ to build? This area was great back in the 90’s without all the traffic. I hate crowds. On December 31, 1999, the City of Palm Coast was officially incorporated. What ever happened to Landon and Netts town center ?????? If you don;t want to drive 5 miles for milk don’t move there.If you want walking distance move to Queens. I believe this northward development was expected. I think this will be great, but they will absolutely need to add a light at the bridge – definitely at the NORTH off ramp (can’t see over the bridge crest to the left, and much high school traffic and old kings traffic from the right). But perhaps both sides? And the infrastructure must be conducive to safe traffic – the parking lot at Island Walk is atrocious, you can’t see around the “beauty grass” in the Target lot, and PLEASE don’t add a round-a-bout with two lanes, or at least draw arrows like Target did. This whole exiting a roundabout from the left lane/ turning right from a left lane (since the outer lane doesn’t have to exit, you could T-bone someone!). Protect the kids better too please. Sidewalks and street lights! Thank you Melissa!! Almost t-boned some one there doing exactly that. Exited right from the left lane. SMH. @Melissa You stole the words right out of my mouth! Spot on with all of it. I am glad that publix will come in or a new shopping center with restaurants, good type. gas station, and more just make sure the one who developed, the one in island walk does not do that one. Palm coast is a nice growing area we need jobs for our kids and people too. Its a retirement area, plus we need stores to go and dont have to go to jacksonville or daytona, that will keep taxes down too. Sure hope Trader Joe’s shows some interest here!